Graham King attended the launch of the new Mazda3 at Silverstone. I've never really understood why you would buy a Mazda. In recent years they've looked good and driven well, but somehow they never quite convinced - I speak as someone who once came close to buying an 04-plate 2.0 Mazda3 Sport but got a Focus instead. But the new Mazda3 is different. The 3 has always stood out in a distinctly samey sector of the market and the new car continues to do so. The detailing around the front is a bit busy, but it's a good-looking thing with some proper presence, thanks to those slightly angry headlights. After the outside, the interior's rather conventional. It's well laid out and feels high quality - even the dreaded elephant hide on top of the dashboard - it just doesn't look particularly interesting. But there's masses of space and the boot's fairly generous. There's oddly little interior storage, though. The new 3 is designed around Mazda's SKYACTIV Technology engineering principles. In English that means relatively light, high-tensile steel structures with ultra-efficient engines. Those engines look a bit old-fashioned on paper - 1.5 (don't bother) and 2.0-litre, four-cylinder, naturally-aspirated petrols, and a 2.2-litre turbodiesel. But don't dismiss them. Both petrol and diesel motors use sky-high compression ratios and low-friction internals to produce perfectly acceptable economy and emissions. Both petrols return 55.4mpg and 119g/km of Co2, while the diesel manages 68.9mpg and 107g/km of Co2. That's a bit off the pace for fleet buyers, but they don't buy Mazda3's anyway. 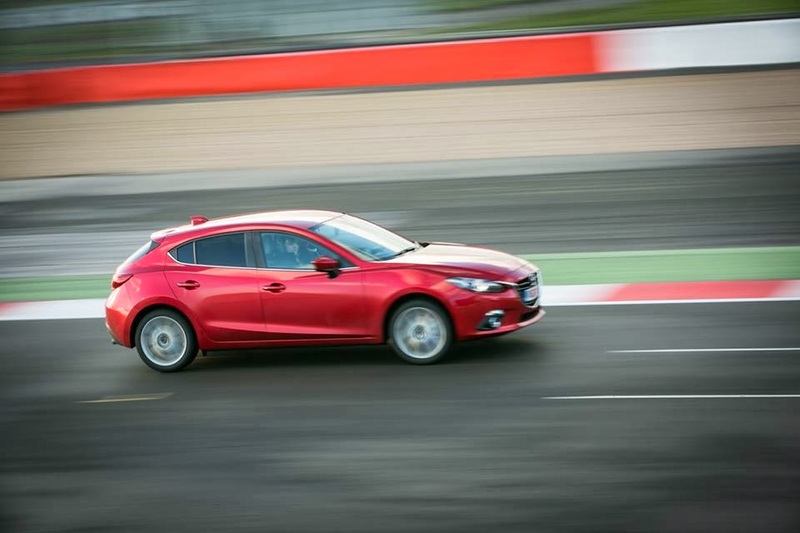 I drove the larger petrol and the diesel on track at Silverstone and both impressed. The petrol isn't all that powerful (118bhp) but it's creamy smooth and pulls hard. Though I suspect what was a nicely rorty exhaust note on track would become annoyingly droney on a motorway. The 148bhp diesel feels meaty (280lb/ft of torque) and carries on pulling right round the rev range, even if it does take a while to haul up to the red line. I thought nearly 100mph in fourth at the end of the Hangar Straight was pretty impressive. And eerily quiet. Both engines come with lovely, snickety six-speed manual 'boxes as standard. But it's the 3's handling that really impresses. The chassis is a scaled-down version of the Mazda6's, so it has a relatively wide track and long wheelbase. That gives it incredible stability it high-speed turns and a fantastic ride - I barely noticed Silverstone's F1-spec kerbs. It's agile too, helped by steering that does what you ask, when you ask. There isn't much feel, but there never is these days. It'll wash wide eventually, but some more throttle brings the nose back into line. I was expecting it to feel out of its depth on track, but it felt right at home. I was pushing it pretty hard (directed by my very excellent instructor, Andi) but it soaked up everything my limited talents could throw at it. It's not quite as much fun as Focus, but it's certainly better than anything else besides. So, was I convinced by the Mazda3? Yes. It looks good, goes well and drives very well. It's well-equipped (you really want the top-spec Sport Nav just for the head-up display) very comfortable and good value. It's easy to get sucked into the Focus/Astra/Golf hegemony if you're spending £20k-ish on a mid-size hatchback. But the Mazda3 is a diversion that's well worth taking.